Using the service is easy: just sign up for an account at the WP Remote website, add your sites, install the plugin into the sites you want managed by the service and set these up by adding the API keys. When the plugin is installed in your WordPress sites, you no longer have to check each site for updates to plugins and themes. You can monitor all available updates through the WP Remote interface. When updates are available, you can remotely upgrade all your sites. WP Remote can handle the upgrading of plugins and themes that can be updated through the WordPress admin interface (almost all plugins and themes except for premium ones). 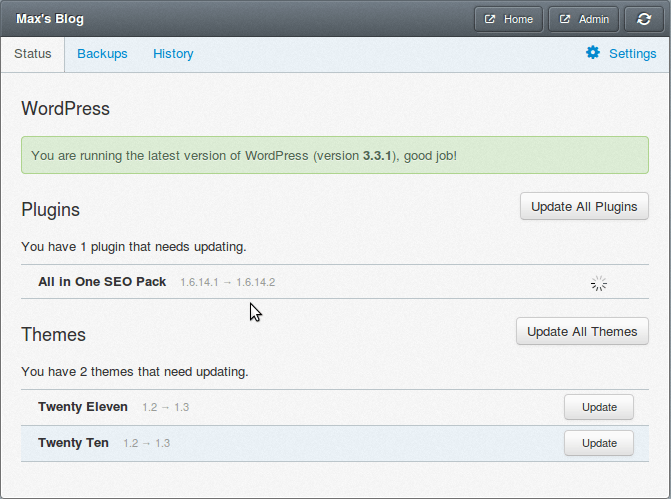 WP Remote also simplifies the backing up of your WordPress database. In the interface, WP Remote says it backs up database and files. But when I downloaded my backup file, only my database was backed up. But it’s good enough for me. (It’s a free service after all). Before WP Remote, I automated the backing up of database files via a different plugin that automatically e-mails the MySQL dump to me. But the database in some of my sites have apparently exceeded the allowable file size for Gmail messages so I no longer get these. It’s also a hassle to manage the files that do get emailed to me. UPGRADING. 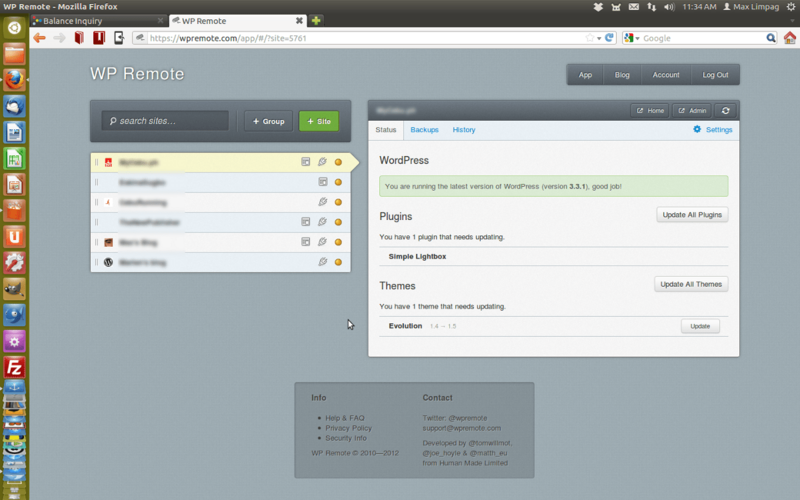 WP Remote allows you to remotely upgrade plugins and themes. With WP Remote, I now have a centralized storage of all my database dumps that’s easy to manage. The WP Remote team said in a blog post that they are considering the option of an automatic daily backup but requiring users to connect to their own S3 account. Manual backups, they assured users, will remain free. The WP Remote website uses responsive design and offers an optimized interface for managing your account and websites in your tablet or phone. As of this posting, WP Remote is now monitoring 15,101 websites.